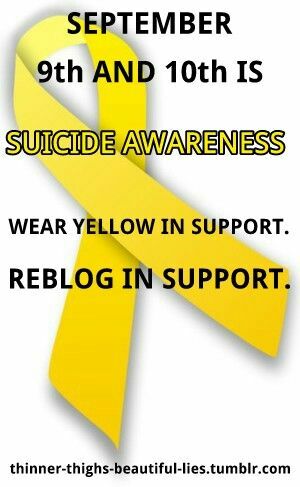 September is dedicated to Suicide Awareness. Vulnerable people don’t always appear to look vulnerable. They look just like anyone walking their dog on the sidewalk, a co-worker sitting alongside you at work, a mother rushing through the grocery store picking up food for her family, a child studying for a test. Yes, people just going along their day normally can be holding in pain so devastating, yet to appear just that… Normal on the outside to the others around them. 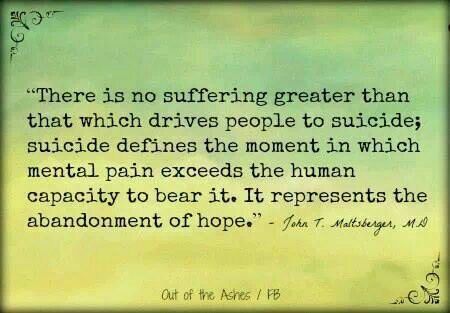 The most horrifying thing about suicidal thinking is the feeling of losing all hope to live. You feel estranged from yourself. Your mind is spinning out of control and the only thought lingering is to escape from your own thoughts. You just want your mind to stop racing and the only way some people see this ending is if they themselves end their lives. I can only speak from my past experience, but this was how my thought processing was. I couldn’t think of anything else but the wanting to die. I plotted, planned, and even attempted. It was the most excruciating pain that I have ever felt in my entire life. Not a day goes by that I don’t count my blessings for surviving that inner turmoil. It was because I finally gave in to my mother pleading with me to seek help, and admit myself in the hospital that I finally received the treatment in which to deal with my suicidal ideation. It was while in the hospital did I learn that I had a mental illness/disorders. It was there, and the mental health facility that equipped me with coping skills. There are so many people here on WordPress that write about mental health. A great number of them have felt that they needed to end their lives at one time or another. Their stories touched me in so many ways, you can’t even imagine. Although, we all come from different back rounds, countries, religions, etc… We share a common bond of survival. If you are reading this post today, or even down the road from the day I posted this… Share your story. Show the people who are feeling alone, helplessness, and hopelessness that they are not alone and that we are here for them. 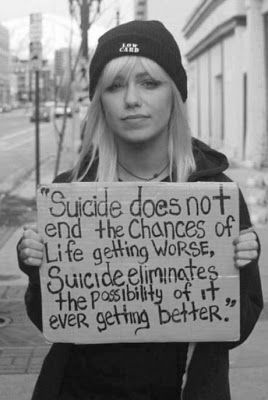 Suicide is not the answer. Reach out to family, friends, clergy, anyone! Get help now! You are important. You have a purpose. You have a voice. Your mental well-being is your number one priority! For other bloggers that would like to share their stories of survival, please join me in raising awareness. You’re so very welcome. We all need to be there for one another and support one another. What’s going on, Sweetie? A very very important post for suicide awareness month from becky over at beckys mental mess! This is an excellent, helpful post. Suicidal feelings and thoughts can seem so rational. It can seem like a sensible solution. 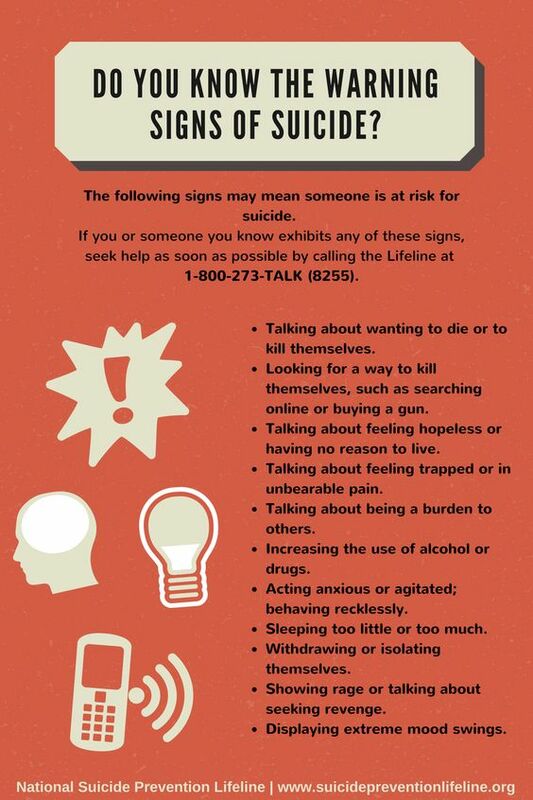 But, since there is often shame attached to suicide, some people do not seek help from the nearest and dearest. And usually, people not trained to deal with a suicidal person cannot help. Professional help is of the utmost importance. Could not agree with you more. Thank you so very much for caring and sharing this post. I greatly appreciate bringing more awareness to this topic. So important to reach out. Do read this thoughtful post at Becky’s blog to raise the awareness about suicide and its prevention. This is a subject that needs your serious attention, it might be yourself, your parents, your child, a neighbor, or a friend who needs help, LISTEN! Thanks for your post on this subject, I’ve reblogged it. You are so very welcome, and thatnk you again for the reblog . 🙂 XO!